We say it in many ways, but it’s really this simple, we will do our best to give you the pool of your dreams and also a great building experience. Over 25,000 California Pools & Landscape satisfied customers can’t be wrong. As you begin to plan and design, you will consider the many styles and options available to you when creating your family’s perfect backyard paradise. We suggest that you also imagine what you’re looking for in the perfect company who will ultimately execute your dream. We invite you to look through our website, spend some time in our massive photo gallery, come down and walk through our design centers, test the atmosphere and listen to the activity. In every aspect of our work, we are all craftsmen – people who take pride in our work and strive to produce a one of-a-kind project . . . yours. LAYING THE GROUNDWORK FOR SUCCESS. At California Pools & Landscape, we believe that communication is extremely important to customer satisfaction during the various stages of construction. That’s why we provide a step-by-step overview of each phase – from the ground up. Meeting your expectations is our number one goal. We accomplish this by ensuring that each stage of your project keeps moving forward smoothly. We work closely with you to coordinate schedules for delivery. Pre-site Inspection: Our team will need access to your yard to verify measurements, setbacks, elevations and public utility locations. Blue Stake: Blue Stake is a public service to locate all public utility lines. Clients may see paint on the street made by each utility. Blue Stake DOES NOT verify locations of septic, sewer, electric, or other lines within the barrier if the property. Drafting: Our in house draftsperson will take your Project Manager’s renderings and pre-site report to create a working CAD engineered plan. You will receive a copy of the engineered plan so that you, the client, may know all measurements, materials, locations, etc. If something does not look right or stands out as different from your perception of the conceptual renderings, this is a good time to bring it up and request any changes. Permit Submittal: Once drafting is complete and there are no red flags from Blue Stake and Pre-site, your project will be entered into your municipality’s Building Review Office for Permitting. Turnaround on the permit process is different for each municipality. Layout: Based on your drafted construction plan we paint an outline of your pool, deck, masonry, and structures on the ground before any work begins. This gives you an opportunity to approve the shape and position before we excavate. Excavators use the layout as a guide when they dig the pool. Construction Manager Set-Up: This is the part of the process where you will be introduced to your assigned Construction Manager. The “CM” will set the height of the pool based on the decking material selected and the slope of the deck and yard. Having your final decking material (NOT COLOR) selection done prior to this stage is crucial. Site Preparation: Prior to the actual pool being dug, it is very important that all important landscape material that is to be saved be marked and irrigation rerouted around the pool. Often, it is necessary to pregrade the yard and take out unwanted landscape material, concrete, and masonry that will be in the pool area. Excavation: Our excavation specifications include vertically excavated walls and flat floors, which create a safer, more enjoyable and spacious swimming pool than the industry norm. In some municipalities we can excavate prior to obtaining the permit. Material Selections: If you have not yet chosen your material colors, now is a good time to do so. The Design Center is a great tool for these selections and we have a Color Specialist on staff to help you. Please call 480-498-2205 to schedule your material selection appointment. Plumbing and Equipment: Our plumbers follow a detailed plan for the location of every feature, pool return and drain. You will notice that pipes are protruding out from the pool dig. These will be cut off near the end of construction and will finish flush to the final pool wall. Steel Rebar: Steel rebar is installed in a grid pattern to reinforce the strength of the concrete shell. The vast majority of Arizona pool companies use standardized steel specifications driven with the belief that the least expensive is the best. But our steel specifications are developed and engineered for your pool, in your particular soil, with the unique load and stress of your pool design. Electrical: Standard features include LED pool lights with remote-control abilities, your selected timer and control panel will be placed with the equipment for daily pool system control. Pre-Shotcrete Inspection: After excavation, plumbing, steel, and electrical are installed, we will call into your municipality to schedule the “Pre-Gunite” inspection. Once a green tag is obtained and set on site, shotcrete will be scheduled. 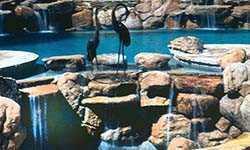 Shotcrete (concrete pool shell): In this phase, steps and benches are formed, spas take shape, and the pool begins to look like a pool. To add compaction strength to the concrete shell, our special mix of shotcrete tests to 4,000 psi, while industry standards are as low as 3,000 psi. The shell is a minimum thickness of six inches thick, and in coves and all stress areas, it’s a minimum of eight inches thick. Gas Line: In most cases your gas line will be installed and inspected after shorcrete. If you have any natural gas appliances permitted on your project, you will need to call your gas company once the pool’s final inspection has passed in order to schedule the hook up the gas appliances to the gas meter. Typically someone will need to be home for this to take place as the pilot light will need to be relit by the gas company. If your gas source is propane then you will need to arrange for the tanks to be filled. Masonry: Having a one source specialist manage all of your masonry along with your pool is critical. The elevations of barbecues, fire pits, fire places, decorative walls, ramada columns and other masonry features is critical to the overall function and look of the backyard. After shotcrete is the time for the construction of the raw masonry for your backyard oasis. Irrigation and Drainage: Prior to decking it is a good time to insure that there is appropriate sleeving or other accommodations for the coming landscape irrigation, drainage, lighting, sound, and other utilities that the project requires. Contractors who are not landscape oriented are likely to forget these crucial items. Decking: During this stage we will be completing your decking system. Concrete based decking will be formed and poured while alternative decking methods (i.e. pavers, travertine, and artistic pavers) will take a bit longer. Alternative decking methods require a formed border, compaction, and overall, will be more of a labor intensive system which adds a week to the building process based on the amount of square footage. Masonry finish work: At this point and at times, concurrent with the pool tile work it is time to begin to create the lasting beauty of the pool by installing masonry finish products like stacked stone, decorative pots, tile, stone, glass tile, paver caps, stone caps, and other finish products. Tile: During this phase, we will install all waterline tiles, step tiles, mosaics, and other tile based features. Carpentry and Finish: In most cities, it will be necessary to have all permits in place for any structures that are to be built. By now we will have the masonry columns in place and it is time to frame the roof, and complete any outdoor living structures. This might include everything from barbecue appliances to tile roofs, lighting, sound, TV systems, fans, drywall, space heaters and a myriad of features that are needed to complete the structures. Final Inspection: After cleanup has occurred, we will call into your municipality to schedule the final inspection. All barriers such as fences, gates, gate springs, self-closing doors, etc. will need to be completed prior to this phase. The municipality will sign off on the project as complete and we will then schedule your interior. Interior Surfaces: After final inspection and municipality sign-off, your interior surface will be installed. Whether you have chosen plaster or Sea Glass Pebble you are only days away from swimming. Start-Up: Once the pool is filled with water, we will send our Start-Up crew out to do all final fine tuning to your pool to begin functional operation and add the proper chemicals. Orientation: You will be contacted to schedule an orientation so you will understand how to care for and operate your new pool. During orientation, you are encouraged to video tape the process of operation and this is a good time to ask questions. Being an informed and educated pool owner, will allow for an enjoyable pool owning experience. We will also leave you with a pole, basket, brush, and test kit. Landscape Fine Grading and Layout: A well planned project by now will be set up for a successful and trouble free landscape installation. Typically this starts with a bit of fine grading and location of all major trees, plants, and features. Natural, effective contours to a landscape are as much art as science. Lighting, Misting, Sound, Video: Underground placement of utilities where they are protected, buried and trouble free is important and should be done right after irrigation. Masonry, water features, Borders and Decks: Any masonry, water features, decks or walkways not completed with the pool (or if this project does not include a pool) should be constructed and installed now. 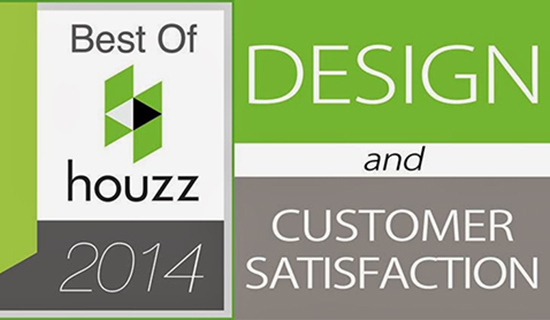 Again, we are the recognized leaders in quality design and construction, there is nothing that we do not do well. We are not practicing on your project, we have 27 years and over 25,000 successful projects to draw experience from. Planting: It is difficult to discuss planting without also discussing selection of the specimens. Our vendors know what we demand and do not try to pass off second rate live material. We routinely reject anything but the best. Care is then taken to plant and nurture the beginning of every plant and trees new home. Inert material: This is when the big pile of decorative gravel shows up and is spread. Our standards dictate two inch minimum coverage and when we are done installing the gravel it is raked and perfect. Synthetic or natural grass: Almost done now, we install the best of Arizona grown and harvested sod. We also offer a complete line of top quality heat resistant artificial grasses and putting green materials. Landscape Lighting: Up until now, you have only seen wire looped up in the backyard where your lights go but we finish off your project with top quality traditional or LED lights designed just for the impact and effect you desire. Instructions and Walk Through: We do a complete walk through of your project and fine tune every item. Then we go over complete operating procedures for your irrigation controls. We also give you full written instructions and links to resources to promote the healthiest environment for your plants. Pool pricing is typically based on a price for a standard sized pool. Pricing can also be affected by the many different design features, materials and equipment installed. Each job site also provides possible variables that can affect the pricing. Let our experienced project managers work with you and help customize the best project for your needs. After each in-home estimate our customers receive a detailed price proposal and plan specific to their project. What is the best way to begin planning for a pool? Our design staff can meet with you at no cost. If you live in the home where the pool will be built, we will measure the yard, consider how construction equipment can enter the yard, discuss potential equipment location in relation to existing utilities and the pool, and begin to discuss your desires. This allows us to create a project matches your lifestyle needs, desired look and budget. If you are building a new home, the pool can be designed from plot plans and a site inspection. Through early planning, you can often save money and achieve a more integrated final product. How do I decide what shape and features I would like? Our design staff will have hundreds of pictures, DVDs, CDs and color plans of many of our past projects for your review. We feel that one of the reasons we have won so many design awards is our ability to listen and hone in on the plan and features that will best serve the client. In addition, we can develop a color rendering of the pool you and our designer will create. This drawing will include a bird’s-eye-view perspective drawing of what the pool will look like from your patio. What pumps, filters, cleaners, water features, automatic systems, deck products, interior surfaces, masonry effects and lighting are best? We feel that our job is to thoroughly explain all the pool features that may interest you. This explanation will include the positive and the negative traits of each product, including costs, how it works and a recommendation depending upon the needs and desires you have expressed. We feel that our clients make really great decisions for themselves when complete information is provided. How do I pick a pool builder? Isn’t every pool the same in its basic construction? California enjoys a solid reputation for our unique construction practices and providing cutting-edge technology and constant customer communication. We believe in building the “best value” into every project. After our project manager completes the design of your custom backyard living area with you, the plan is prepared for construction. The CAD construction plans are created and any special engineering is generated. Our processing department, construction team and project manager review these plans together and then apply for permitting. The project is then painted on the ground followed by a site visit from your construction superintendent. This is his first of many quality control inspections. The next phase of the process begins with the excavation of the pool, spa and any sunken bar areas. We construct our pools with vertically excavated walls, create slight radius at the transition to the floor and flat floors. This type of construction requires more steel and concrete but our customers find a larger, more usable pool. This method of building also allows us to provide the best warranty in the pool industry. We can warranty your shell for as long as you own your home and this warranty can be transferred to a new owner. What really makes this building practice even more special is it also allows us to warranty the pool against rust “migration or bleed through” from the steel in the shell to the surface of the pool. I would ask this of any pool company you are considering constructing your pool. We build all of our decks specifically for expansive soil. All of our poured decks have a continuous 4-inch turndown to prevent moisture from getting under the deck. Our decks are not tied into our shell with sky bars. If the ground underneath is expansive and needs to move, we want it to move independently from the pool shell. By floating the deck we can prevent damage to the shell and elaborate repairs to the surface of the deck. At California Pools we provide the start of the technology that helps reduce the cost of running, maintaining and using your pool. We can offer control systems, multiple speed pumps and sanitation systems that can benefit you for many years to come. We are also continually searching for ways to reduce the carbon footprint of our product. LED pool and spa lights are now available and offer lower wattage than standard pool lights typically used in the industry. You will get many more hours of usage before the light bulbs need to be changed. The additional benefit to LED lights is that the customer has the ability to change the color of the pool water at night. The LED lights come with four colors and can be upgraded to run by remote. How long will my pool take to build? California Pools averages just under six to eight weeks of actual construction time for every pool we build. This is a point of pride for us, particularly when you consider the complexity of many of our pools. Specialized products and/or material availability could possibly increase construction time. A good rule of thumb to use when planning a project is one week of construction time for every $4,000 of pool cost. In other words, a $20,000 pool should be complete in five weeks after the excavation is complete, while a $40,000 pool will take about 10 weeks after the excavation is complete, depending on the complexity of the project. Many factors combine to affect construction time. We find that comprehensive pool planning and design can reduce changes and unexpected delays. What should I know about pool layout? The pool layout is the painted shape and position of the pool that we paint on your ground prior to any work being done. It is used as a guide for excavators when they dig your pool. We ask that you approve the location and shape of the pool prior to scheduling the dig. Because it’s a flat representation of your pool, the layout will appear much smaller than the finished pool. We lay out the pool 6” larger in every direction. In other words, a pool that will finish 30′ long must be laid out and dug 31′. This allows for 6″ thick concrete on the pool walls. I’ve heard there is a lot of dust, noise and destruction at dig. Is this true? There is no gentle way to remove 15 to 30 dump truck loads of dirt out of a backyard. This will be one of the noisiest and is certainly the dustiest stage of construction. It is also one of the most exciting. We routinely see kids of all ages with their noses pressed against the window as the pool begins to take shape. Protecting plants and existing landscape is a must because anything between the street and the pool that is not cared for will be ground into the soil by this heavy machinery. Fences need to be removed, dogs put up, and the right machinery must meet the conditions in your particular yard. Your pool designer will discuss the options and pricing with you when you design your pool. What is a rock (hard) dig, and how are the extra costs involved handled? A rock excavation is encountered when the machinery that’s has been planned for your yard cannot dig the pool without using special techniques and equipment due to the soil conditions. If the crew finds that their machinery is incapable of the dig, the excavators will expose the soil condition by digging a hole and leaving it open. Typically, we will secure three bids and get your approval on the extra costs prior to proceeding. If you suspect you are in a rocky area, we can secure a bid and make it part of the original agreement. This can save time and allow for the extra costs to be financed. Many times excavators can dig a rock pool in about the same time as a pool in softer soil. To accomplish this task, we contract with highly skilled machine operators. These workers are more experienced and skilled than typical laborers, providing peace of mind that the job will be done right. How do I know that my plumbing is done correctly and will not leak? In addition to using Schedule 40 PVC (very thick pipe), we keep all plumbing under pressure throughout the construction process. We routinely check these pressure readings to ensure that the plumbing is secure. Our plumbers follow a detailed plan for the location of every feature, pool return and drain. You will notice that pipes are protruding out from the pool dig. These will be cut off near the end of construction and will finish flush to the final pool wall. When is my equipment plumbed in place? If you live in the house where we are building the pool, we will install the equipment the day we plumb the pool. If your home is not occupied or is under construction, we will delay the equipment set until you are in the house. This is necessary because unfortunately there are people out there who will walk off with your pool equipment if it is easily accessible. If you own the home and the equipment is stolen, your insurance will cover the loss and will pay the replacement cost. From a technical standpoint, once the equipment is attached and installed, you own it. What does steel reinforcing do for my pool? The steel rebar is installed in a grid pattern. Depending on the loads and soil condition, it can be 12″ apart, 6″ apart, or in rare cases 3″ apart. Our civil engineers work out the exact pattern to be used for your pool, and this is part of the engineering required for your pool permit and for our structural specifications. The steel is blocked 2” to 3″ off of the excavated floor and walls of the pool. It greatly strengthens concrete by providing tensile strength. Be careful — although we cover or bend the ends of the bars to protect people, the wires used to tie the steel together are very sharp. Please ensure the safety of children and pets. A scratch from the steel or tie wire can infect easily and may require a tetanus vaccination. What protects my pool from electrical problems? In most cases, a trench will be dug from your electric panel to the equipment location. By code, this conduit must be metal, wrapped with insulation and buried 6″ underground. It is important to mark any sprinkler lines or other obstructions that must be protected. The conduit must remain uncovered until the city inspects it. GFI circuits protect all light and electrical plugs. These are also used near sinks and bathrooms inside your house. GFI-protected circuits instantly trip and shut down when contact is made with water. In addition, all steel, motors and metal within 5′ of the pool are grounded. You may notice small copper wire attached to metal windows, fences, handrails and diving boards. When does the city inspect my pool? The first inspection occurs after electric and before shotcrete. The city inspector ensures that all electrical connections and work are proper. They also review the pool’s structural engineering and steelwork. They do not inspect the shape of the pool, pool depth, or in most cases, pool plumbing, as these are not safety or code issues. They will check the pool’s location to ensure it is out of all setbacks and easements. We typically have very little problem and get a green tag to proceed quickly. In some cases, inspectors will ask to see more engineering verification than is normally necessary. We provide this at our expense. While the delay can be frustrating, it is better to be safe now than sorry later. Remember that these inspectors are trying to ensure the best and safest possible construction. We do not control their schedules, but in most cases, they are remarkably responsive. When will my pool start looking like a pool? The pool really begins to take shape when the concrete is placed. Steps and benches are formed, spas take shape, and the pool begins to look like a pool. Shotcrete (premixed concrete) is sprayed into your pool through a hose under pressure. It’s noisy, messy, surprisingly artistic and fun to watch. A curtain is put up around the pool to block the over-spray from getting on you house. Shotcrete dries and gets hard very quickly. As a matter of fact, it can dry too quickly. It is necessary for you to water-cure your shotcrete to slow the drying time. In the summer, wet the pool down at least five times a day, more often if you can. In the cooler months (temperatures below 80 degrees F), two to three times a day is fine. Spray water on the sides until it starts to “sheet” off. Then move on to another part of the pool. It takes about 10 to 15 minutes to complete a pool watering. Don’t worry, you can’t over water a pool. A puddle will accumulate in the bottom of the pool, and that’s ok; we will pump it out later. You will also notice cracks forming in the pool, particularly in the floor. This is normal. These are shrinkage cracks and do not affect the structural integrity of the pool. The shotcrete shell needs to cure for three to four days before we can proceed with construction. What has to happen before my deck is installed? 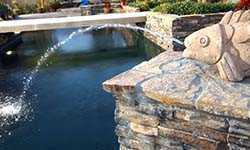 We must have all rockwork if things like boulders and waterfalls are part of your pool. This is also a good time to install any masonry such as barbecues, fire pits, benches and equipment walls. Any gas lines, landscape sprinkler and drip lines, landscape lighting lines, etc., that are to be run under the deck should be in before we form for the deck. This is also a good time to review and make sure that the way your deck is designed on the plan is still the way you want it. Extra costs wlll result if you make changes to the deck after it is installed. What are my responsibilities concerning the deck? Here’s where the pool starts to look really pretty. We always find that once the deck gets started, our customers get very excited and start planning their first pool party. The deck crew will come out and put up forms (thin strips of wood) outlining the deck. You will see where any steps and drains go. You must approve these forms prior to the pouring of deck. Once the deck is poured, it cannot be changed. It’s a good idea to double check the color and texture you have chosen to make sure it is still your favorite. The concrete for the deck will be poured into the forms and troweled to a smooth finish. If you have Kool Deck®, it will be applied now. If you have Cal Deck, it will be applied when the concrete is dry enough to let it adhere. Other types of toppings and deck, such as flagstone, tiles, pavers or artistic stone, have their own requirements. Regardless of what kind of deck you have, stop water-curing your pool, do not walk on or get water on the deck, and do not cover the deck with anything for at least 48 hours. Concrete does not dry evenly so it will appear to be darker in some places and lighter in others. Don’t worry, it will reach a consistent hue after it gets through a full summer’s heat. How do I make my pool safe and ready to pass final inspection? Access walls, gates and springs (gates must be self-closing), sliding door closures, window locks, wrought iron fencing, etc., are all done at this time. Types of required barriers — which restrict access to the pool — can differ depending on the city you live in. The pool cannot be finished until your city is satisfied that all required barriers are in place and functioning. The inspector will check for barriers and you must be at home during the inspection to demonstrate them. Please see your designer or construction scheduler for more information. When do I get rid of this construction mess? We would like your help in policing any personal trash. It is absolutely our policy that gum wrappers, drink cups, lunch sacks, etc., never be left on your property. We consider it to be a great help if you let us know at any time you see trash of this kind left in your yard. By staying on top of this problem together, we can keep it to a minimum! The unavoidable construction mess begins at shotcrete as the concrete truck gets cleaned out and continues until the deck gets cleaned up just prior to the pool being finished. Trenches are all filled, light grading is done, and the yard is raked. Basically we make everything neat and presentable. Landscaping is not provided unless it was part of your pool contract. How do I get the go-ahead to finish the pool? We will call the city for a pre-interior finish inspection. This is where the city checks that all of your barriers are to code. Types of required barriers can differ depending on the city you live in. We cannot schedule a specific time for an inspection, nor will the city agree to a specific inspection time. Because the inspector needs access to your home to check some of the required barriers, you must be there to give him/her access. This can be frustrating, but if the inspector cannot inspect all barriers, he/she will leave and we will need to call for another inspection. We are at the mercy of the city here. We cannot legally proceed with construction until the city gives us permission. Your construction scheduler can advise you of the barrier code requirements if you are installing them yourself. In any event, whether we install them or you install them, you still need to be home for the inspection so the inspector can enter your home. Some cities do not have interior barrier requirements and final inspection goes much easier there. How do they get the plaster or Sea Glass Pebble Sheen into my pool? At last! All interior finishes are pumped into the pool from the street. Plaster: Plaster will be applied, and the plasterers will start your hose to fill the pool as soon as they are done. Do not turn off the water until your pool is full! Let the pool fill all of the way up until it reaches about an inch below the deck; then turn the water off. This is slightly overfilled but you will be backwashing, and it helps to have a little extra water in the pool until the plaster dust is filtered out. Follow the plaster care instructions given to you by California Pools. The plaster may appear a little mottled because the plaster does not dry evenly. (Yes, it really does dry under water). Some parts stay wet longer and so appear darker, like a wet spot on a shirt. Brushing the pool and chemical balancing are extremely important on a plaster pool. Plan to spend a lot of time during that first week caring for your pool. Sea Glass Pebble®: Your Sea Glass Pebble will be applied on the first day and acid washed the next. The acid wash exposes the pebble aggregate. The workers will start the hose filling the pool as soon as they finish acid washing.Do not turn off the water until your pool is full! Let the pool fill all the way up until it is about one-half the way up the skimmer opening. The color will appear slightly mottled for about three months. It takes that long for the chemicals to finish the curing and bleaching process. You will have a much easier time taking care of the pebble finish than a plaster finish. The product’s main and popular feature is that it is naturally forgiving. You will see variations in stone colors and concrete exposure. This is why Sea Glass Pebble camouflages many of the traditional problems with pool plaster—it is to be expected and is desirable. When do I learn how to use the pool? At startup we turn the pool on and check the system to make sure everything is working properly. Then, at the orientation, you will be told everything you wanted to know about a pool and probably even more than that. Plus, we show you how to work the pump, filter, light and the rest of the equipment. Video cameras are permitted and encouraged. You can also refer to our Pool Care FAQs here some of the most common questions. Also, you can request a re-instruction at no charge within 30 days. We recommend you wait about a week before requesting a re-instruction. By then, you will have specific questions that can be addressed. With California Pools, building a pool for your Arizona vacation home is a breeze. Our long history as an Arizona pool contractor has helped us truly understand the needs of out-of-state buyers, so whether you’re in Colorado or Canada, New York or Nebraska, we make the process easy and hassle-free. We stay in constant contact throughout the building process, providing construction schedule updates and photos of our progress via e-mail. And you’ll have the peace of mind that your swimming pool will be built to your specifications. If you’re not in Arizona year-round, we can help with automatic cleaners and other options to make your pool as maintenance-free as possible. That way, when you’re in town and ready to enjoy your new pool, it can be ready too. And if you’re only here in the winter months, we can help you explore heated pools and spas as well! Here’s what one customer had to say about the pool building process while out of the country. I’ve had a lot of good things happen to me in the past year. First I bought the house in Chandler in October and didn’t see it (other than pictures) until I got there in November. I could do that because I found a realtor that is a good person and I knew I could trust. Now I’m on the way back to Chandler next Monday to a new pool and landscaping that I have not seen (again other than pictures). It’s so nice to know there are good people like all of you taking care of everything. The pictures have been great by the way, and can’t wait to get there and see the pool full of water. Guess that should be sometime today. What a new year’s present. I know all of you do this everyday, but you made all of us up here in Canada, feel as though this was your one and only important job! I hope you all had a safe and happy Christmas and I wish all of you a most successful and prosperous new year. A custom pool is just what it sounds like – a pool that has been designed exclusively to fit your property and lifestyle. A custom pool can incorporate countless variations of water features, lighting, and landscaping. Do you want a pool that enhances the views from your property, do you want a luxury pool that is a gathering place for family and friends, or would you like a pool that can be used for fitness or therapeutic purposes? 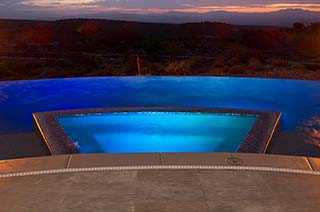 The possibilities are endless with a custom pool and at California Pools, every pool is a custom pool! California Pools is the most awarded pool designer and builder in the U.S. We build custom pools designed exclusively for you to fit your budget, taste, and lifestyle. When we think of a “traditional” pool, we often think of a long rectangle used for swimming laps. Today’s traditional pool takes that rectangular shape and builds upon it to create a pool that is unique. By adding water features, lighting, exciting finishes, or landscaping, a traditional pool can become something that is completely yours. Traditional pools tend to be more formal and are a wonderful complement for an architecturally classic home or minimalist landscaping. California pools can help you adapt a traditional pool so that it makes exactly the statement you desire. Just because a pool is traditional does not mean that it is boring! A geometric pool combines all the shapes and angles that we remember from our school days. The geometric pool has even lines and features from steps to spas to cut outs. California Pools can design a pool for you that incorporates rectangles, squares, arcs, or circles – or any combination of these! Your pool will be custom designed to best fit the size and shape of your yard. If you want a deck, a geometric pool is an excellent choice. A geometric pool has a modern look and feel and is a great way to make your pool a design feature for your property. A freeform pool is exactly that – a pool that follows no particular shape. The freeform pool is a series of curves that create the pool’s outline. A freeform pool is a perfect choice for a pool that is designed for cooling off and relaxation. The human eye finds curves naturally soothing and a free form pool lends itself to a feeling of peace. California Pools will design the curves of your freeform pool so that they harmonize with your landscape and surroundings and bring the utmost in relaxation to you. A natural pool often incorporates a waterfall, rocks, or even a beach entry for an oasis like feel. Whether you want to bring in the native plants of your surroundings or to create a tropical feeling, a natural pool is the perfect way to do this. A natural pool can blend into your property giving it the feel of a hidden treasure and respite from the cares of daily life. A natural pool is perfect for gatherings with family and friends or for just floating alone and enjoying the sound of falling water. California pools will help you decide which features will bring you just the ambience you want for your pool and landscape. Artistic pavers will give any pool an elegant look. They will not crack like concrete and are wonderful for avoiding stubbed toes due to their beveled edges. Artistic pavers can be slightly more expensive but their extreme durability makes them worth the cost. Artistic pavers are available in unique natural stone, coral, seashell, and tumbled finishes. They are also slip resistant and stay cool so you can avoid burnt feet. The huge amount of finishes and colors give you an endless amount of choices to enhance your pool and landscaping style. This stone surface is an excellent choice for a natural style pool. It will blend well with waterfalls, boulders, or any other similar feature. Travertine is available in many shapes, sizes, patterns and colors so it is extremely versatile. Travertine can really add a touch of elegance to your pool and yard. Travertine is also slip resistant and stays cooler on the feet. Concrete pavers are another choice for a pool deck. Pavers can be made to look like stone or brick and the variety of sizes they are available in means that they can complement almost any type or shape of pool. Concrete pavers will be hot in the AZ summer so this is a great deck option for all those winter visitors. California Pools is an authorized dealer of Belgard interlocking pavers and also works with Phoenix Pavers to offer you an astounding array of options. Concrete is a traditional pool decking material but it can crack and get awfully hot. Now you can use concrete for your pool deck with an acrylic topping. The acrylic ensures that your deck stays cooler in the heat, resists cracking and breaking, and is slip resistant. It is also very easy to clean with nothing more than a garden hose. 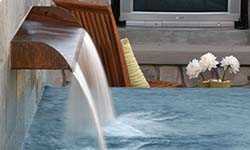 The acrylic also helps protect the deck from erosion by chlorine and saltwater. This is a wonderful deck for a traditional pool or a custom pool with lots of curves. Flagstone is a sedimentary rock which means that it is soft and porous. This makes it another excellent choice for pool decking as it will absorb water quickly so that it dries quickly as well. It also means that it is slip resistant. Flagstone can be cut into tiles (which looks great with a formal pool) or it can be laid down in natural slabs (which makes it a beautiful complement to an oasis style pool). It is also low maintenance and long lasting so it is a great value! Pebble finishes consist of small , smooth river pebbles embedded in the pool finish product. Pebble pool finishes have grown hugely in popularity over the past few years. They are extremely durable and resistant to the chemicals in the pool water. There is a wide array of colors and color combinations available that can be used to get just the look you want. Many owners of natural or free form pools choose this finish. The texture can be a drawback as it can be less gentle on skin than other traditional pool finishes. Plus, cost can be a factor, but like tile pool finishes, the long term durability of pebble finishes can pay for itself in the long run. The Sea Glass Pebble finish is buffed so that it is smoother than the traditional pebble finishes. Thus, a Sea Glass finish is more gentle on skin than standard pebble finishes. The addition of abalone shell and a 30% mix of iridescent glass beads adds a luminescence that is unmatched by any other type of pool finish. Sea Glass Pebble is available in a variety of colors and color combinations so that you can customize your pool to achieve the look and feel that you want. The extreme durability of this pool finish and its easy care, make it worth the investment. For a one of a kind pool, Sea Glass Pebble with Abalone Shell is the way to go. Pool plaster is a marble based mix that has been used since the 1960’s. The smooth, white plaster surface is a mixture of white cement, white quartz, and white marble giving the water a sky blue color. Tile finishes for pools have been around for a long time (Romans, anyone?) and for good reason. Tile is durable and low maintenance. The infinite variety of colors and combinations means that you can create a look that is uniquely yours. Many pool owners like a mosaic style while others have chosen designs like dolphins, turtle, or fish to enhance their pools. California Pools can help you create a pool using tile that is like no one else’s! Although pool tile costs are generally more than all other pool finishes, it rarely has to be replaced like other finishes, thus a tile pool finish can pay for itself over time. Beadcrete is a swimming pool finish that is a polymer mortar impregnated with tiny glass beads. A Beadcrete pool finish has many advantages. It can be applied to the tightest of curves and its adhesion properties make it very resistant to the effects of the constant exposure to the pool water and chemicals. It is also very easy on skin and will not irritate the bottom of your feet. Finally, the glass beads give the finish an especially sparkling appearance that can be breathtaking. A Beadcrete pool finish is more expensive than traditional plaster pool finish but much more durable. 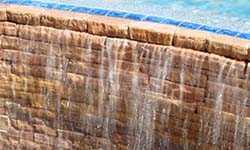 A scupper is an opening in the pool wall through which water drains. In the old days, it was opening in the wall of a ship that allowed water to drain from the deck. 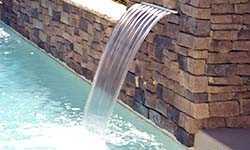 Today, a scupper is a widely found water feature on many pools. Scuppers can be made of many materials and incorporated in many different ways – making them very versatile and adaptable for the type of pool and landscaping you have. Here you can see that the scuppers are made of stone for a classic look and feel. A vanishing edge is sometimes also known as a disappearing edge or an infinity edge. This is where the edge “merges” into the next body of water and creates a visual effect of “vanishing”. It can be incredibly dramatic and is often found at luxury resorts around the world. Imagine being able to create this atmosphere at your own home! A spillway is a long chute that provides a controlled release of water from a larger body of water. It is typically found on a levee or dam but it makes a beautiful and original water feature on a pool. In this photo you can see that the spa doubles as a water feature with the stacked side of the spa forming a gorgeous spillway. Scuppers can be made from many different materials. In this picture, the scuppers are made from copper lending a beautiful modern look to the pool while incorporating the colors of the desert environment as well. What a wonderful way to blend the desert landscape with your sparkling pool! In this photo, the scupper is made from custom stone. While most scuppers tend to be very geometric in their form, they can also be customized and reshaped to fit your aesthetic. 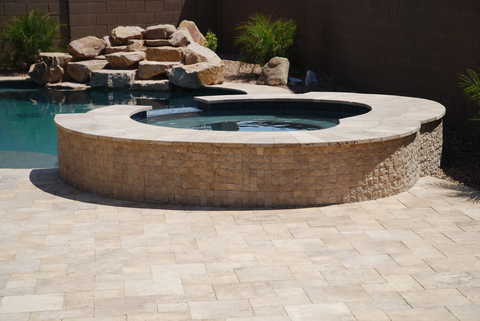 Whether you have a traditional pool or an oasis style pool, scuppers can be created from almost any type of stone or metal in any shape so that they establish exactly the setting you want. 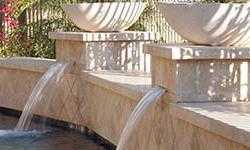 A sheer descent water feature is when the water falls vertically or almost vertically down a straight wall. The effect can be very subtle or incredibly dramatic. The walls can be made from many different types of stone and other materials. 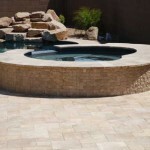 The walls can also be straight or curved to fit a geometric pool or a customer pool. There are no limits! A water spout is similar to a faucet and the flow can be adjusted according to the amount of water you want flowing into your pool. 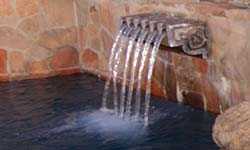 If you would like a quiet trickle for an intimate evening or a roaring gush of water for a large gathering – no problem! In this photo, the spouts emerge from classic columns giving this pool an elegant Roman feel. Here is another example of using more than one water feature in order to create completely unique surroundings for your pool. Here a copper spillway from the spa connects it to the pool while a sheer descent on the pool wall adds a gorgeous visual of smooth, rippling water. 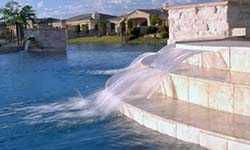 Fountains are another possibility in adding the sights and sounds on flowing water to your pool. Fountains are found all over the world in parks and gardens and anywhere people crave the coolness and calming effect of trickling water. Fountains can be customized in many ways depending upon the way you want to express yourself. Here a fish sends a sparkling arc of water into the pool in order to create a pleasing splash for your ears. 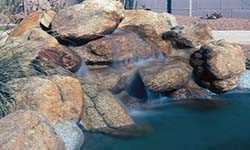 The small natural rock waterfall is an extremely popular water feature. Because it doesn’t take up too much room, it can fit into almost any landscape and pool size. It is also a beautiful way to incorporate the natural rocks of the desert landscape into your pool environment. 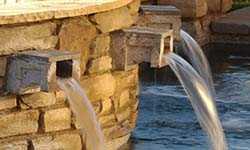 Even though the waterfall may be small, the sound is still extremely soothing and adds to the peace of your surroundings making your pool a refuge from the cares and worries of the outside world. A lateral waterfall grotto can create romance and mystery and really works well with an Oasis style pool. Having your own hidden grotto in your pool can make you feel like you are on an island in the South Pacific. Imagine being able to hide from the heat of an Arizona day behind a cool sheet of water – how refreshing! LED pool lights are a really popular choice these days both for new pools and existing pools that need a little “freshening” up. These lights use much less energy and produce less heat which is a bonus in our hot climate. 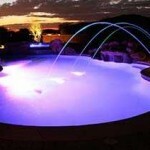 LED lights can be used in many different ways to produce an inviting glow in the pool. Another gorgeous way to light your pool is with fiber optics. Both fiber optic lights and LED lights can be installed in different colors or you can even have an array of color changes for your pool. These lights can set any kind of mood you like – from romantic to festive to serene. It’s your choice depending upon the activity you have planned. A basic incandescent or halogen light may be placed under water in the pool wall. This is a very common type of pool lighting and is a simple and effective way to allow swimmers to see in and around the pool at night. This is a great and economical way to extend the amount of time that you can use your pool. These lights require very little maintenance and give you thousands of hours of light before the bulbs need to be changed. My wife and I moved to AZ 2 years ago and after a painfully hot summer have accepted the fact that we need a pool. No, we MUST have a pool! So we’ve discovered that shopping for a pool is much more involved than we expected. I now understand what it takes to dig a pool from scratch. Of all the places I dealt with, these guys stand out more than any other pool company I met with. Considering I don’t know anything about pools, they were very patient and willing to teach me what was involved, not just sell me the best pool pump! If you read my reviews you’ll know how important service is to me which is why I was so impressed with this place. All the people I visited that had their pools done by these guys had nothing but great things to say about them. The one thing I liked most is that they have their own landscape division. My wife really wants an outdoor BBQ and the convenience of having all of that done and designed by the same people is great! Good people, good service. I’d recommend these guys to anyone. We had an amazing pool building experience with California Pools, from start to finish. Dave was our main contact, and explained the process thoroughly and completely when we came in to the office. He came out to the house just to confirm what we thought our measurements were. California Pools gave us a great and very competitive price, so with that and with the experience we had working with Dave, we chose to go with them. They were outstanding in every aspect – we got a phone call and email letting us know what each stage of the process was, and when it would be occurring. Each step was seamless and the crew was great. Our project was completed in about 6 weeks and we couldn’t be happier. I’d definitely recommend California Pools to anyone! Matt Murman designed a beautiful pool area landscape for our yard in Phoenix. We told him a few “musts” and he filled in the rest. Everything from the stones to the Lemon, Orange and Palm trees look fantastic. We couldn’t be happier. Thank you, Matt and California Pools & Landscape. We just completed our pool “face lift” with California Pools, the finished product is gorgeous, we are very pleased and receive compliments by everyone that sees it. CA Pools had more options for pool surface finish and tile than any of the others we got quotes from. They also have pool models where you are able to view several options in working pools, this is extremely helpful and important when choosing the surface finish, seeing it under water on a large scale can make all the difference. We also really liked our sales person, Mike McConnell, he was personable, knowledgeable and really believes in the company he works for. There were bumps along the road during construction but that is a normal part of an undertaking of this magnitude. Everyone at CA Pools was helpful and patient, responsive and accommodating through the entire process. I would reccommend them to anyone without hesitation. California Pools made the pool building process as easy as I could have imagined. They were great about being in very regular contact via email all through the process and they made special accommodations for our HOA too. I can highly recommend them to anyone looking to build a great pool. Our pool turned out beautiful! It’s exactly what we wanted down to the last detail. 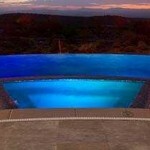 After a lot of research, we choose California Pools to install our pool. We first met with Darren. He was really nice. He explained the whole process to us and answered all our questions. The poll was installed in a timely manner. Our backyard went from all dirt to this beautiful landscaped view. We were very pleased with the outcome. We would recommend California Pools to anyone looking for a beautiful backyard.